1. Two kinds of sounds calm me down... ocean waves and bowling pins being knocked down. 2. Don't get stuck in traffic after a rectal examination... unless you can stand up like in the MRT or crowded bus. 4. Greeting people on their birthdays are great ways to get back in touch with those you've lost contact with. (Thank God for friendster birthday alerts). 5. The Yellow Pages have gone a long way from being just "yellow". I recently discovered they're now in color (on yellow colored-paper). 6. 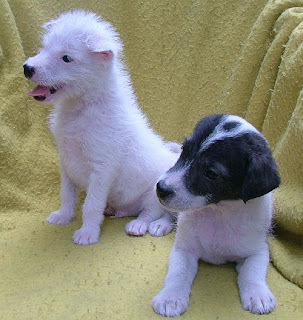 Based on our 2 terrier pups which were placed for adoption, people who want to buy puppies prefer female over male. I guess a dog who looks like a female doesn't pass buyer standards. 7. Check the clothes you wear before going out. If you discover a hole, go back home to change, go buy a new one if you're out or worst case, remember the location of the hole and keep it secret so no one knows. 8. Determine beforehand how many glasses of a beverage you can drink before choosing between a single serve and a bottomless drink. 9. A game a day makes me a happy Jay. 10. Piolo Pascual is flawless... and makes you realize what features you lack, are underdeveloped or simply don't have. Lastly, I'd like to mention that this past month has been an emotional rollercoaster, filled with mysterious twists and unexpected turns. But now, it's smooth sailing on a leveled path with no bottom slopes... always at the top. My best friend was always there riding beside me. It took me 10,000 miles of separation to realize that. Thank you sweetie for coming into my life. Kawawa naman ibang pahina ko dito...walang amoy at tamis. hehehe! if it means anything, there are people who don't find piolo pascual attractive at all (yes, people like us exist)! @cyberpunk - my sweetie is MY brad pitt, di lang piolo hmmm... and take note mas nauna pa ako nagka-HD diyan hihihi. @ederic - kinilig naman ako hehehe!